Social media posting with Content Motive can help your dealership gain website traffic and leads by interacting with potential buyers (or returning buys) on websites they are already using. With social media use at an all-time high, regular postings are a great way to get followers to see your website or content and lead them back to your dealer website or inventory. Our team provides relevant content to your brand, services, or automotive manufacturer that attracts and retains the attention of your potential customer base, encourages your customers to share the information to their own social networks, and brings them back to your website during the car buying process. Social media marketing is driven by electronic word-of-mouth, and works on nearly every mobile device currently being used for product or service searching! By providing your customers with relevant information and the opportunity for personal interactivity with your dealership during the vital research process of the car buying journey, your dealership then creates a deeper connection and reputation of trust with your buyers. Why Choose Social Media Posting with Content Motive? • Our posts are local SEO-friendly. 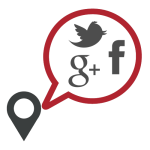 • We can integrate your social media posting with your automotive SEO content, micro-content, and/or blogs. • Having fresh content can help increase your likes and shares on your various social platforms. • Posting up-to-date information and news directs your customers to your dealership and keeps them coming back to your feed as an authority. Contact us now for social media SEO answers and a quote for what benefits Content Motive services can bring to your company.